The Vermont Fish & Wildlife Department has kicked off fish stocking work across the state, an effort that will ultimately result in over 1 million fish being distributed into Vermont waters in 2017. The work includes the strategic distribution of brook, brown, lake, rainbow and steelhead trout, as well as landlocked Atlantic salmon and walleye. One popular component of the stocking program is the trophy trout initiative, which stocks large, 2-year-old brook, brown and rainbow trout in lakes, ponds and rivers throughout Vermont. “Nearly 15,000 trophy trout will be stocked this year, and anglers will be able to fish almost 21 miles of rivers and 16 lakes and ponds that are designated as trophy water,” Miller said. 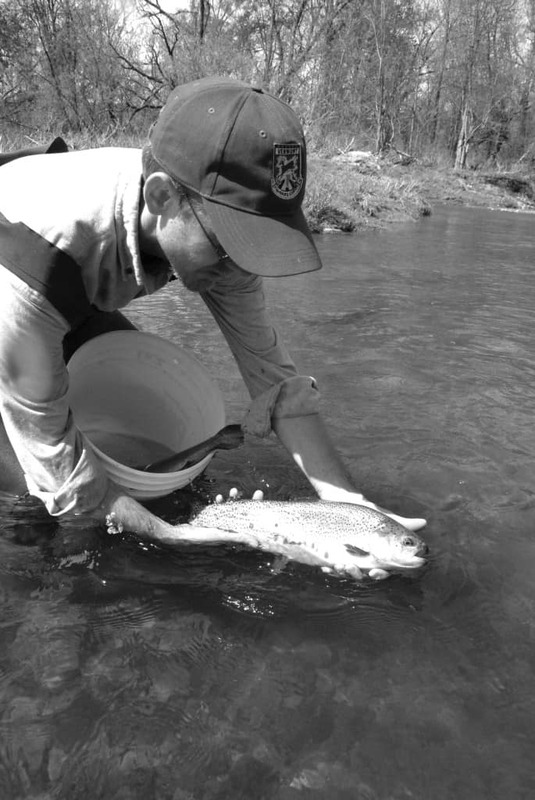 The following streams will be stocked with trophy trout between now and mid-May: Black River, Otter Creek, East Creek, Passumpsic River, Lamoille River, Walloomsac River, Missisquoi River and Winooski River. Stocking of trophy trout in the following lakes and ponds is also in progress at Amherst Lake, Lake Rescue, Black Pond, Lake Shaftsbury, Echo Lake, McIntosh Pond, Holland Pond, Mill Pond, Kent Pond, Miller Pond, Knapp Pond No. 1, Smith Pond, Lake Paran, Stoughton Pond, Lake Raponda and Sunset Lake. For a complete 2017 stocking schedule, to purchase a fishing license, or for more information on fishing in Vermont, visit vtfishandwildlife.com. Fish & Wildlife are busy stocking ponds and lakes around the state.